Despite 21 points from Dylan Pourier (1), the Raiders fell to Brandon Valley Thursday in the opening round of the Boys Class AA State Tournament in Rapid City. RAPID CITY, S.D. 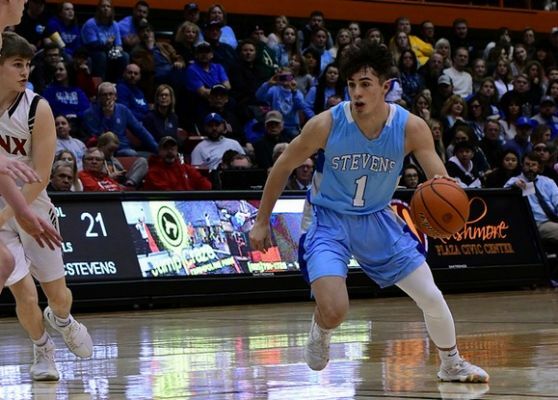 - Rapid City Stevens was no match for Brandon Valley as the Lynx opened up the Boys Class AA State Basketball Tournament with a 58-47 win. Stevens jumped out quickly on the Lynx -- leading 14-9 after one quarter. But, Brandon Valley would outscore Rapid City Stevens 17-7 in the third quarter and 18-9 in the fourth. Dylan Pourier led Stevens with 21 points. Carter Olthoff scored 21 to lead Brandon Valley. In other games Thursday, Yankton cruised to a 62-42 win over Huron, Harrisburg edged Sioux Falls Lincoln 41-39 and Sioux Falls O'Gorman beat Sioux Falls Roosevelt 65-46. Harrisburg will play Brandon Valley in one semifinal Friday night, with the other semifinal featuring Yankton against O'Gorman. Stevens will play Lincoln in the consolation.